Business risks are becoming more diversified with the rapid social changes underway. Tokyo Gas has established a risk management system to identify and minimize the impact of potential risks that could affect our business operations. Also, we are developing a crisis management system so that we can continue operations and quickly resume normal business activities even during unforeseen circumstances such as natural disasters and pandemics. Tokyo Gas has set up an enterprise risk management (ERM) system and identified major risks in its Risk Management Regulations. The Risk Management Committee, established to advance our ERM, periodically checks on progress regarding the establishment and operational status of the ERM system, reports results to the Corporate Executive Meeting and obtains the necessary approvals. 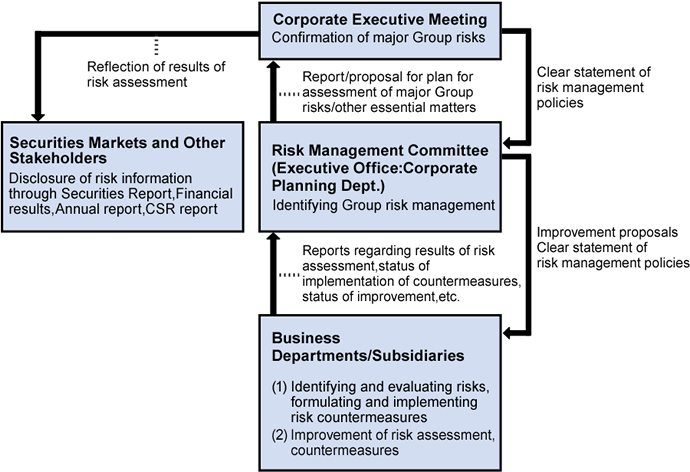 Under this framework, around 150 risk management promotion officers are deployed in the business departments of Tokyo Gas and its subsidiaries to promote ERM. Each year, we assess risks and the implementation and improvement status of countermeasures. This system facilitates the steady implementation of the ERM-PDCA cycle. Since the Company provides public services that are essential lifelines, it has for many years also operated a crisis management system that serves as a response system in the event of an accident or other risk-related incidents. Specifically, we formulated the Emergency Response Regulations, with which the Emergency Response Organization will respond accordingly and immediately in the event of a crisis,including major natural disasters such as an earthquake, production or supply disruptions arising from major accidents at LNG terminals or pipelines, influenza outbreaks, terrorism, failures in mission-critical IT systems, and compliance problems. The Company periodically conducts training on major risk response measures. We have also formulated a business continuity plan (BCP), which outlines how the Company will respond in the event of a major earthquake of the magnitude assumed by Japan’s Cabinet Office, major accident disrupting gas supply, widespread power blackout, influenza outbreak, or large-scale mission-critical IT system stoppage. This plan is in place to reinforce our risk management system. The Tokyo Gas Group provides training programs to promote risk management. In fiscal 2017, we held training for Risk Management Promotion Officers and newly appointed general managers and managers (newly appointed mid-level managers) in each department of the Company, and for subsidiaries so that they could appropriately perform necessary risk management in their respective positions and enhance their risk management capabilities. To further enhance a corporate and organizational culture that encourages appropriate responses to managing risks, we established our clearly defined Escalation Rules, which require that information on any apparent major risk, such as accidents and disasters, be reported to the appropriate supervisory staff in a timely and appropriate manner.